Study Finds 10 Million Fewer Childhood Deaths In India Than Predicted : Goats and Soda Researchers used an innovative method to come up with the data for the years from 2000 to 2015. What's behind the encouraging trend? Why Did India Have Ten Million Fewer Childhood Deaths Than Predicted? 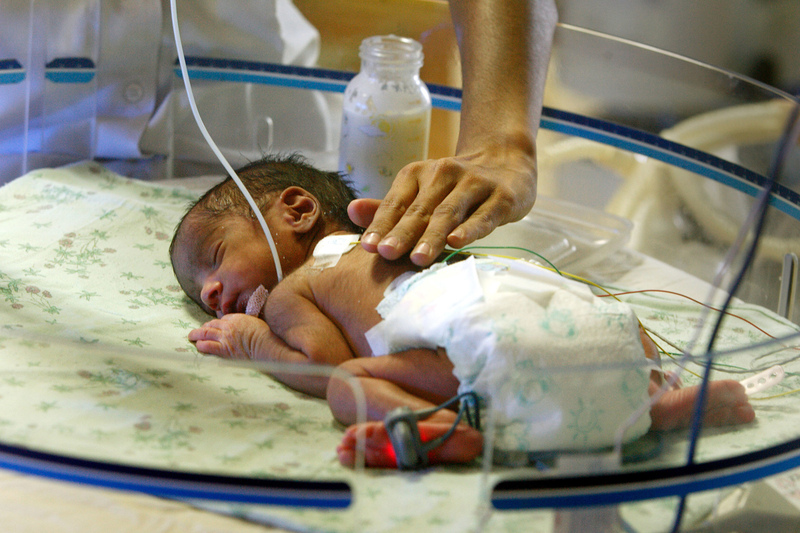 An infant receives medical care at a New Delhi hospital. The study has a depressing name: The Million Death Study. But its latest set of data, published in the journal The Lancet on Wednesday, is anything but depressing when it comes to the topic of childhood deaths in India. India has the tragic distinction of being a world leader in childhood deaths. Between 2000 and 2015, the death toll for children under the age of five was 29 million — a fifth of global childhood deaths. That's an overwhelming number — but it could have been much worse. The findings from the study say that the overall child mortality rate slowed down significantly. The total deaths for that 16-year period would have been an estimated 39 million, based on deaths in the year 2000 of nearly 2.5 million children in that age bracket. It's a challenge to track childhood deaths in India, where most deaths, especially of children, happen at home and without medical attention, says Prabhat Jha, head of the Centre for Global Health Research of St. Michael's Hospital in Toronto and the lead researcher of the study. "Hospital data are good in the small number of hospitals that are monitored, but most hospitals don't record causes well," says Jha. To get a more accurate picture of deaths in India, the Million Death Study linked up with the census bureau to get data not only about numbers but also causes. "Families know what happened to their loved ones, generally," he says, adding that this data set collected from home visits and first person accounts is more reliable than models or projections. From the general data about deaths, Jha and his collaborators focused on deaths in children. They found that mortality rates among infants younger than one month fell from 45 per 1,000 births in 2000 to 27 in 2015. And the mortality rate for children between one month and five years old fell from 45.2 to 19.6. The gender gap also narrowed. The death rate for girls fell from 54.2 deaths per 1,000 girls in 2000 to 21.2 in 2015. For boys in 2000, the number of deaths averaged 37 per 1,000 live births and 18.1 in 2015. The study found that these rates started falling in 2005 and declined faster between 2010 and 2015. They also found fewer child deaths in urban areas and richer states than in rural, poorer areas. Over 15 years, about 900 trained surveyors from the census bureau interviewed more than a million households in randomly selected areas. But, for the Million Deaths Study, the researchers also probed the cause of death by including in their data what Jha calls "verbal autopsies -- a detailed 2-page structured list of symptoms and a half-page narrative of the family's story of the death in the local language." Houses were surveyed every six months so the data on all deaths stayed current. These reports were converted into electronic form and emailed independently and anonymously to two out of 400 trained physicians, who then checked and documented the probable underlying cause of death. Specifically, the study found that during the survey period there was a 90 percent drop in neonatal deaths from tetanus and measles, two of the main causes of infant deaths in India. And for children ages one month to five years, mortality rates from pneumonia and diarrhea, the two leading causes of child deaths in the country, fell more than 60 percent. "The point is that child mortality is falling, but it appears to have fallen faster after 2005 when there [were] more actions against some of the leading killers of children," says Jha. That same year, India launched the National Health Mission initiative to address the health needs of underserved rural areas by building more health centers, providing free diagnostics, surgeries and drugs. The project also introduced vaccine drives and special centers for pregnant women and newborns. It's not all good news though. The authors believe that up to three times as many deaths could have been avoided, given the differences between child mortality between more developed and poorer states. Plus, they note, mortality rates for premature or low-birth-weight babies rose in the 15 years of study, especially in rural areas. The most important feature in this study is the development of the "verbal autopsy" tool, says Abhay Bang, director of the Society for Education, Action, and Research in Community Health, a public health institution, who was not involved in the study. In their own research, Bang and his colleagues previously found the actual infant death rates in one state they surveyed were 33 percent higher than official estimates. "The right data on the cause of death is very important, because the solution and interventions depend on the diagnoses," says Bang. The census has been collating causes for many decades but the new study, with its methodology of repeated home visits and a probing questionnaire, has made the data more specific and reliable, he points out. "Every country wanting to improve health needs a map on how to get there," says Jha. "The Million Death Study is the GPS for better health in India, and can be replicated in other countries." In India, though, to meet the United Nation's Sustainable Development Goals of reducing child mortality by half, the authors urge the government to pay attention to factors such as the mother's wellness, nutrition and access to health care during pregnancy.